Oops… I did it again. I forgot to take photos of this main course du jour, once it was all layered, baked and poised at its prettiest. It’s a shame, this “lamb”sagna was really a treat. I spent a long time poring over what spices and add-ins to put in the sauce (eventually settling on a Moroccan theme, with fresh mint and raisins), what type of cheese to top it with, and if/how to make fresh pasta sheets for it. Whenever there are friends coming — and this was the circumstance — I try to go a few extra miles. Yet once my guests arrived, raring to nosh, the photo-taking session was all but thrown to the wayside. Again. Let’s go back to 2000: the world is placid now. Oops… I did It Again debuted at number one on the Billboard 200 just a hair after it was released, and remained in top three albums there for 17 weeks. If you didn’t hear the title song that year, you might as well have been in a box. This was far before there was any K-Fed, Sean Preston, paparazzi bat-swinging, when Britney was the envy of every teeny bopper of the world, not the least of all for her fit figure. If you can imagine what that was like again, for just a second, let’s remember that period a spell. 2000. I really digress. Oops. So, if you’re able to backtrack and recall what this post was originally all about, this lambsagna was created for a party I was hosting — a lasagna-themed party. The reason for this was because two weekends ago, episode “Lasagna” of the Food Network show Ask Aida, in which I appear, aired. (Thanks to some of you who managed to catch it and were kind enough to mention it to me!) Because I don’t get cable, my friend David kindly took on the task of taping the show. 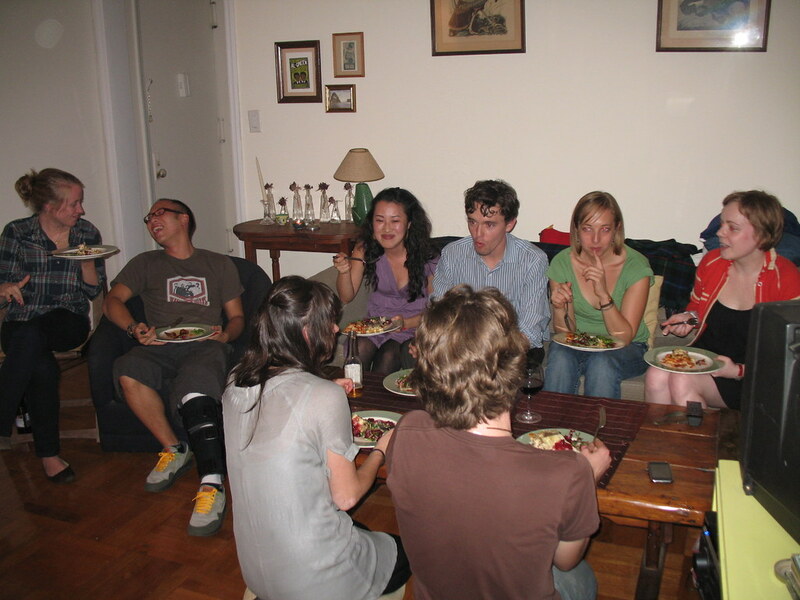 The idea was, we would all gather at my place for some homemade lasagna and other snacks, watch the episode, and, well, continue to eat and drink. The glitch was (and indeed, another oops, though not on my part), David missed the first few minutes of the television show. So when we popped the tape in my rickety old VCR at the party, there was about one quarter second’s flicker of my likeness on the screen, saying about one eighth of a syllable. Then it cut back to Aida, in a studio kitchen: “Well, Cathy, it sounds like you have a lasagna landslide” she said, or something like that. It was a real gas. So although I may have missed out on photographing the finished lasagna for you, I hope that my sincere efforts to make up for it with a very long, and long-winded text post will suffice, just this once. Isn’t “oopsing” fun sometimes? Remove casings from sausage and discard. Heat a tablespoon of olive oil in a heavy skillet and brown sausages, breaking up into small pieces, until cooked through, 3-5 minutes. Transfer to a separate bowl and clean out pan. Heat another tablespoon of oil and cook the chopped onions on medium-low until softened, about 6-8 minutes. Add the garlic. Transfer the canned tomatoes to a bowl and crush with your hands until pulpy. Add them, along with all the juice, to the pan and raise heat to medium-high. Add the sausages, raisins, all the spices, salt and pepper. Bring to a gentle boil, stirring occasionally. 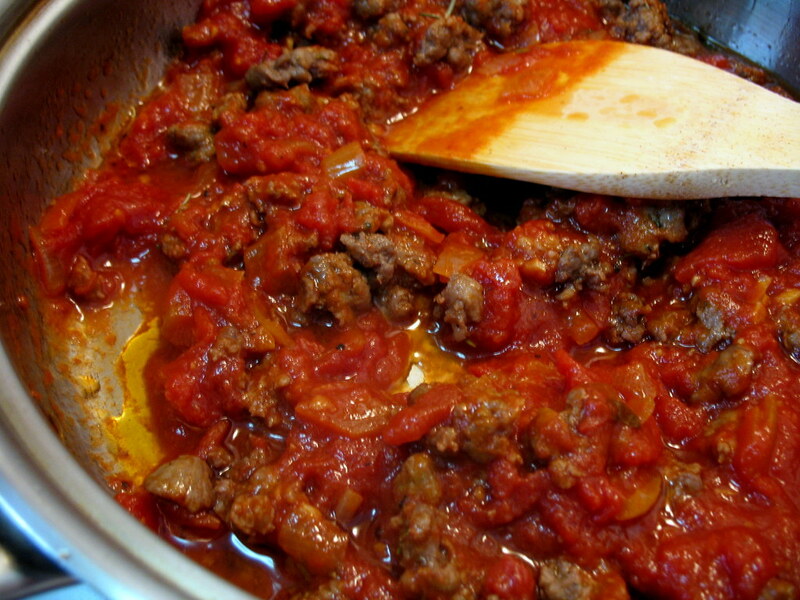 Reduce heat to a slow simmer, cover and cook at least 20 minutes. Taste for seasoning, adjusting salt or any spices as desired. Stir in the lemon juice. Add hot water if mixture is too thick. 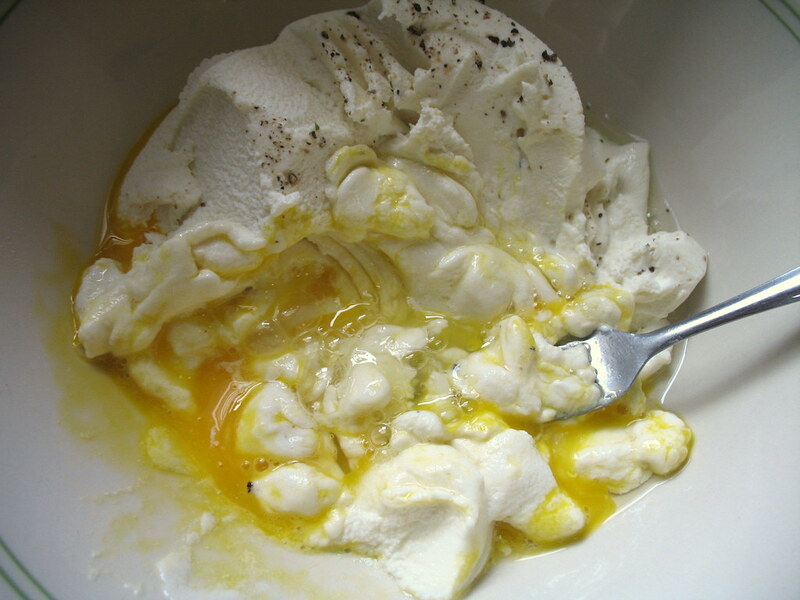 Meanwhile, in a large bowl beat the egg with the ricotta, along with generous pinches of salt and black pepper. 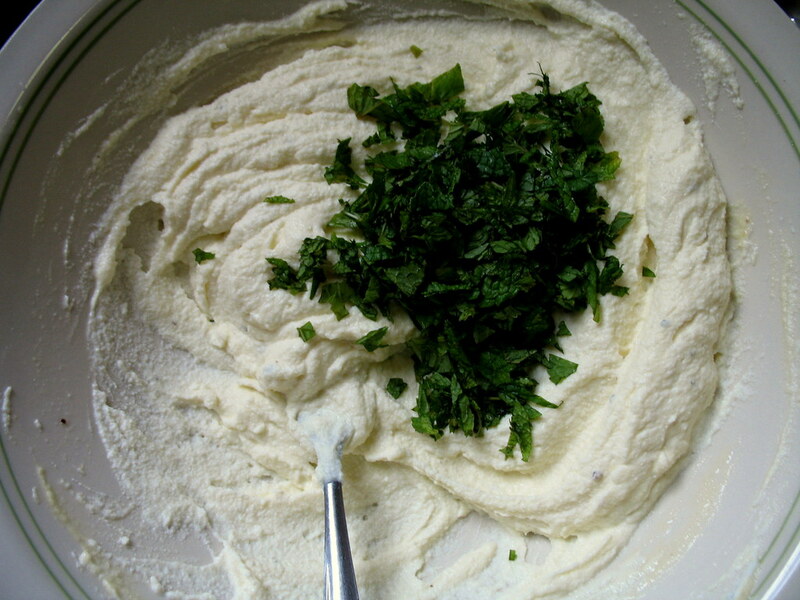 Stir in the fresh mint. Sift flour into a large bowl or work surface. Create a well in the center, and crack the eggs into it. Begin spinning the eggs to with your fingers, slowly taking in some of the flour from the edges of the well as you beat the eggs. Continue spinning, gradually incorporating more flour, until the mixture just comes together to form a ball. On a well-floured surface, knead the dough for 8 minutes. Cover with plastic and let sit for 15 minutes. 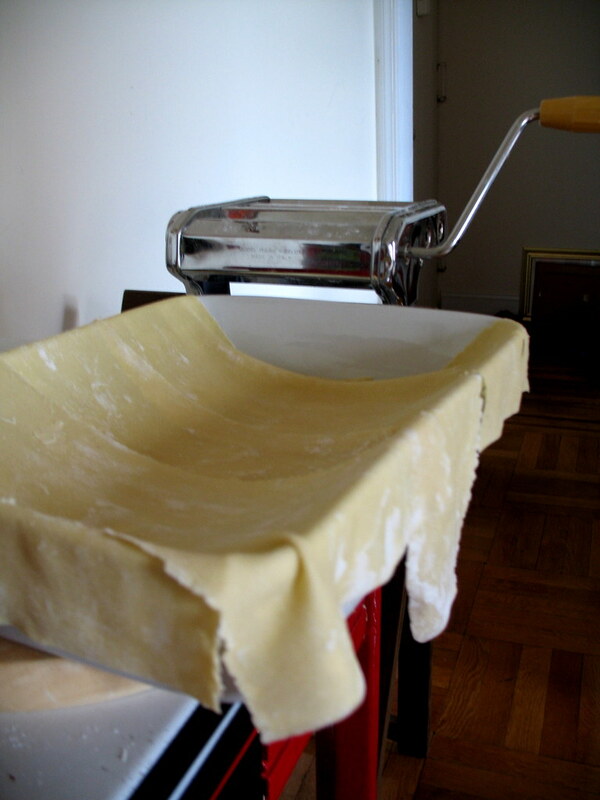 Cut dough into five or so workable chunks and run through your pasta maker, remembering to flour both sides well before each new setting. Crank to the machine’s second-thinnest setting. Lay sheets flat to dry for about 30 minutes before layering into a casserole. Five brownie points: This one kind of hangs on the fence. For a hearty main course, you could do a lot worse than some lamb fat, cheese and rich, eggy noodles. But you could do a lot better. I wouldn’t subtract the meat in this one, as the lamb really provides the pungent, gamey flavor that brings the whole thing together — but I would subtract any excess grease from the pan after browning the sausages. Nutrition-wise, this is a little lacking in vegetable strength but provides a lot of calcium from the cheese, antioxidants from the tomatoes (and raisins?) 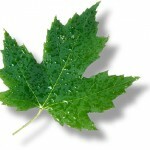 and a little leafy green representation from all that fresh mint. Oh, YUM. I love lasagna and I love the Moroccan spices you used, the dish sounds terrific! I wonder if you could use yogurt instead of or in addition to the ricotta… I have no idea how it would stand up to baking, but I imagine the yogurty tang would work well with the other flavors here. 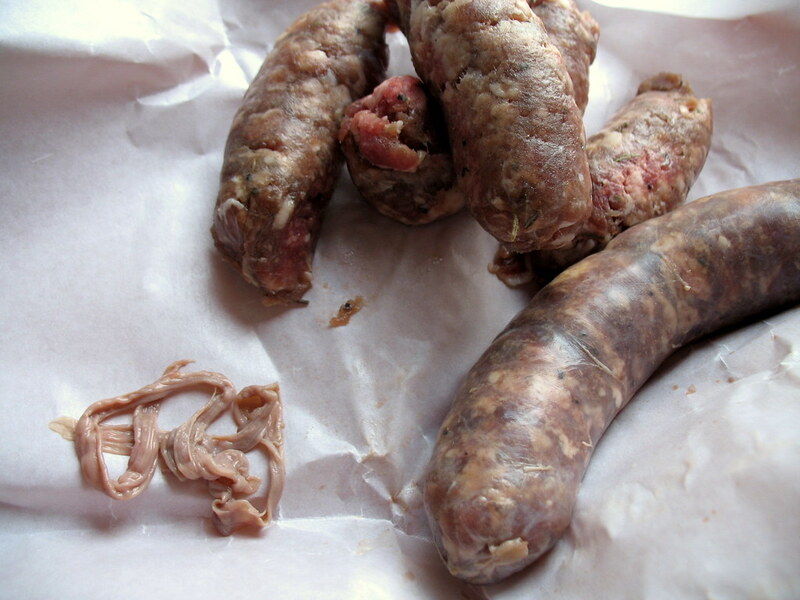 Also, I bought some Merguez sausage from one of the greenmarket lamb vendors, and I was a little underwhelmed — the meat itself was really high-quality, but it seemed a bit under-spiced to me. Just something to look out for, I guess, although if you’re adding your own spices to turn it into a sauce you can always adjust accordingly. Don’t feel bad, I do the same thing all the time! Your lambsagna sounds terrific! I totally understand the forgetting to photo the finished product. The food usually get inhaled at my table and frequently I only remember after the fact…oh well! I love your cost calculator.